Born in the Schofield district of rural Oahu, main island of the Hawaiian group, Rene early showed signs of the musical brilliance which was later to bring him fame in the smart clubs of Waikiki. An accomplished musician, equally at home in the demanding world of Beethoven, Mozart and the masters of the past and the modern fields of Brubeck and other jazz giants, the young American of Filipino ancestry started his study of the piano at the age of four. By the time he was in high school, Rene had formed an orchestra and secured a booking at the leading night spot of his home town. Still concentrating on the classics, he studied with island teachers and seemed destined for a career on the concert stage. Two years of study at the Juilliard School of Music in New York, where he commanded the respect of teachers and fellow students, came to a halt when he entered the U. S. Armed Forces. During a tour of duty in Japan, he performed at base concerts and in leading Tokyo night spots. It was there that the now familiar Paulo style developed. It combines the strict demands of the classics with the free swinging improvisations and unrestricted joy of jazz. Returning to Hawaii upon completion of military service, the youngster was immediately booked into The Clouds, a Waikiki nitery which showcased the talents of June Cristy, Jeri Southern, Mel Torme and other top names. His success was immediate and he continued his conquest of the island musical scene in most of the better clubs along Waikiki's miracle mile. Recently, Rene formed a new group and it is this combo which backs him in these selections. The sidemen are Ed Shonk, bass; Bruce Hamada, drums; and Tomo Fukui, guitar. Rene has always been impressed by the clear melody line and haunting beauty of Pacific area music, and in this compilation of recordings Rene brings to new life the enchantment of the world's exotic land of love. The selections include Misty Sea, Sakura, and Here is Happiness, a Japanese love song which has become strongly identified with the artist. Stranger in Paradise, Three Coins in a Fountain, Over the Rainbow, and Sayonara are melodies written expressly for specific films, and the exciting renditions of the Rene Paulo Group brings back the golden moments of the screen. Akaka Falls, one of Hawaii's greatest, this Johnny Noble-Helen Parker composition pays tribute to the island scenic wonder. Rene's use of arpeggios suggests the thundering beauty of the cascade. Pupu Hinu Hinu is a song of island sea shells; Isa Lei tells of Suva Bay in the Fiji Islands, a romantic port of call, and is the setting for this beautiful love song. 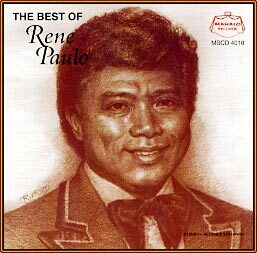 Here, then, is Rene Paulo, Hawaii's favorite pianist, playing the songs he loves for the people he loves.